Interestingly, the colour Orange derives its name from the orange fruit (citrus sp) and not the other way around. While there is no butterfly group known as 'the oranges', orange is one of the most common butterfly colours, except for in Swallowtails (papilionidae), where it is usually only found in small spots. The colour is bright and often symbolises fun and entertainment. 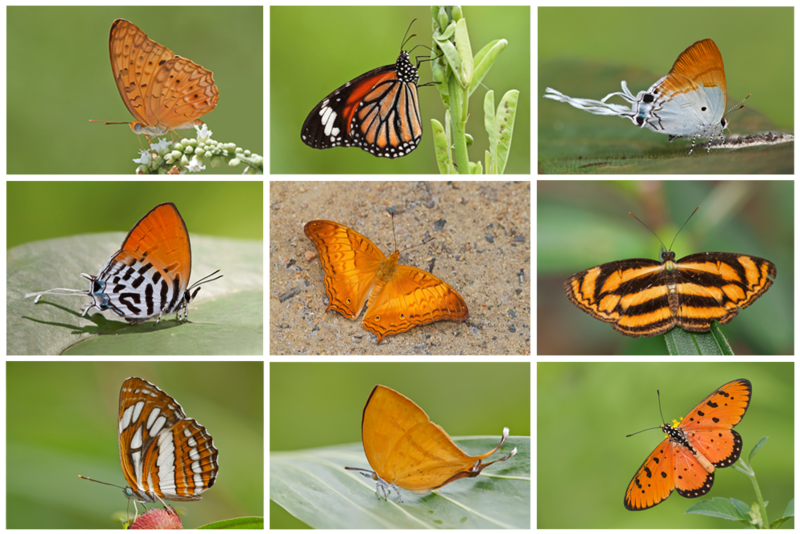 For butterflies, orange is often used as a warning colour, like red and yellow. Many milkweed butterflies, such as the ever-popular Monarch, use this colour to advertise their poisonousness. Great selection of pictures. I think orange is the most common colour for butterflies that occur here too. Thanks Nick! There's even more orange over where you are I think, with the fritillaries and tortoiseshells. You always have such interesting and gorgeous butterfly pictures! I wish to I could see them too with you as a teacher! I never grow tired of your pictures too. I wish you could come and see them. They are much more beautiful in person!